Methane seeps in the ocean are much more important to life in the ocean than we previously have suspected. 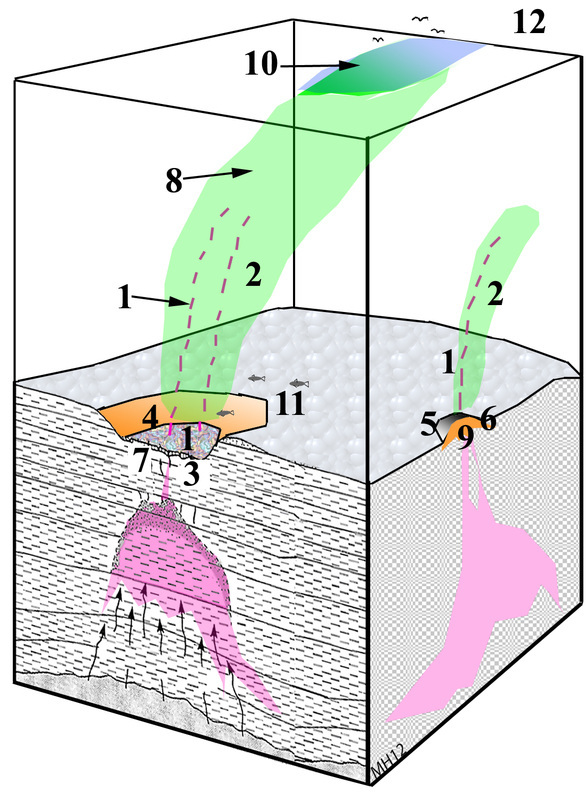 Sketch showing the effects of methane (and light oil) seeps in the ocean. 12) methane anomalies in atmosphere. Note, that not all of these effects occur at all methane macro-seeps that have been described so far. There are still several questions remaining to be answered in relation to seeps like the Heincke seep. seepage (Hovland et al., 1993; Kennett et al., 2000; Westbrook et al., 2009). consider microbial oxidation.” (Reeburgh, 2011, p.
locations, where detailed mapping and investigations have been conducted. the seafloor and into the water column, in the long run, and on a broad scale? This may represent a typical ‘emerging science’, as discussed by Brett et al. buoyancy through the water column, they will cause turbulence in their wakes. methane provides higher concentrations of methane in the near-surface seawater. lacustrine methane macro-seeps provides a preliminary list of what to look for when searching for seeps. that are not only geological in nature, but also biological and geochemical. researchers in the fields of oceanography and limnology.